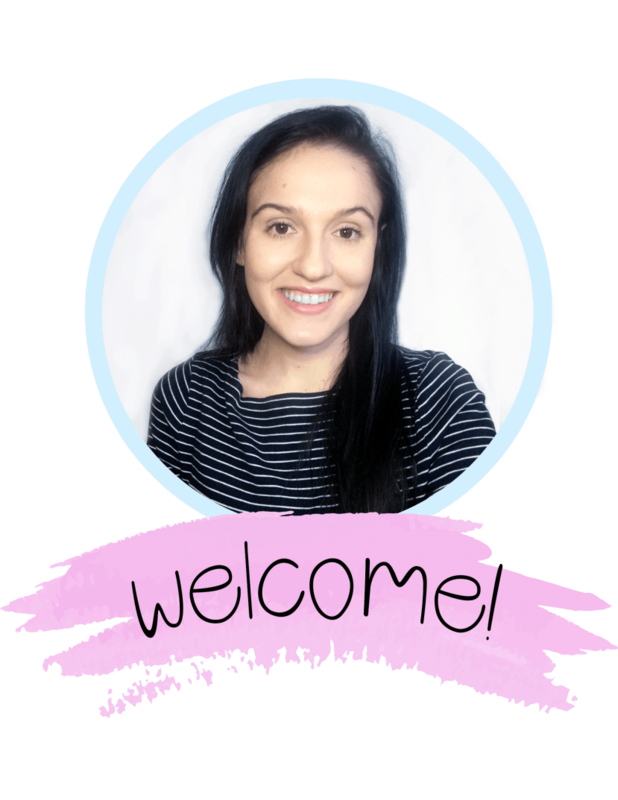 When I first started getting into my Cricut Explore, I’ll admit – I was completely clueless. I had done a million Pinterest craft projects before, but never with vinyl! Honestly, I didn’t realize that there were so many different types of vinyl. I thought that heat transfer vinyl was just those printable iron-on sheets of paper you can buy at Walmart (that have seriously NEVER worked for me). I joined a few Cricut Machine & Silhouette Cameo Facebook groups, hoping to get some answers. I mostly found a lot of people who might as well have been speaking another language! Talking about Oracal this, or HTV that. I was even more confused than when I started! I needed to learn my basics first. After much research (and tons of trial and error), I navigated my way through the confusing, but amazing and vast world of vinyl. 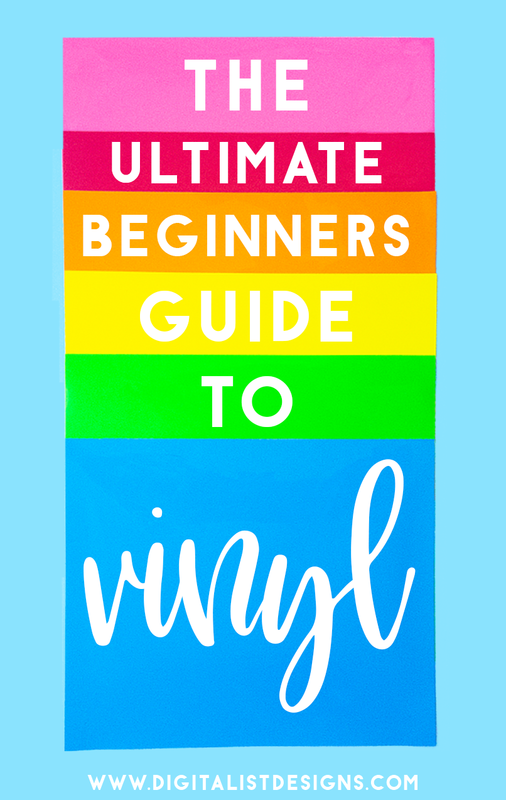 In an effort to save you guys some time, and to cut down on some of the trial and error, I made this beginners vinyl guide! In this vinyl guide, I explain what the different types of vinyl are called, and what projects suit each type best. If you’d like to save this page so you can refer back to it while working on your next project, I made it easy for you with this Pinterest friendly image. This type of vinyl is great for projects that are a little more temporary in nature. Oracal 631 is mostly for indoor projects, as the adhesive is strong enough to last a little while, but can’t stand up to heavy use. Oracal 631 has a matte finish, so it looks especially good for wall decals, since there is no light reflected from it. Sometimes it can even make designs look like they’re painted on the walls! Sometimes when I’m working on projects, I prefer to use Oracal 631 to test out an idea to see if I love it. If I do, I often replace it with a more permanent vinyl like Oracal 651 to ensure that my design lasts. If a vinyl says it is permanent, then it is likely to be Oracal 651. This type of vinyl can stand up to heavy use and is even used on commercial signs. Oracal 651 is water resistant, so it can be used outdoors no problem! You can technically use it on more temporary projects, but the strong adhesive is likely to leave a lot of residue, and possibly peel up paint from your surface. I’ll be honest here. I don’t believe that there’s any vinyl that would be considered “dishwasher safe”, but I’ll admit there’s been once or twice that my Oracal 651 vinyl decorated mugs have made it into the dishwasher, and they came out perfectly fine. This may not be the case for everyone, but for me, it just showed that Oracal 651 is the real deal! This is the type of vinyl you need if you’re going to be making custom clothing! It’s also known as T-Shirt Vinyl or Iron-on Vinyl. It comes in a variety of brands, but the most often recommended is Scisor EasyWeed. When I was first starting out with my Cricut, I tried to cut costs by using different brands. I always had problems with them pulling up while I was trying to weed, or peeling off after ironing – even with my heat press. Once I tried out a sheet of Scisor EasyWeed, I was an instant convert! Seriously, they don’t call it EasyWeed for nothing! This stuff weeds like a DREAM! Plus it holds up through the washing machine, and looks amazing. After cutting it out, you use a heat press or an iron to apply the vinyl to a fabric surface. You can layer this vinyl on top of itself, so you can layer different colors to make more intricate and beautiful designs. It comes in a variety of colors and styles (glitter vinyl, metallic, holographic, glow in the dark, stretch & more), and is insanely versatile. Printable vinyl might seem familiar if you’ve ever used one of those printable iron-on transfers where you buy a pack of “light” sheets for white shirts, and “dark” sheets for shirts with color, and after a few washes the transfer is ruined. However, I can confidently tell you that times have changed! Printable vinyl comes in both Heat Transfer and Adhesive varieties. Using a regular old inkjet printer, you simply print out the design onto the vinyl and you’re good to go! You can combine this with your Cricut or Silhouette to do a print n’ cut. You then have an amazing, unique sticker or iron-on! If you’re wondering why printable vinyl isn’t quite as popular as the other types of vinyl, here it is: the quality of printable vinyl varies wildly depending on the brand. After going through many, many types of printable vinyl, I finally found a brand that works perfectly every time. For printable heat transfer vinyl, my go to is Expressions Vinyl Inkjet Printable HTV. These printable vinyl sheets work for both light AND dark fabrics. I’ve used it on both and it holds up great! Everything I’ve made has lasted several washes without fading. I used my basic Canon inkjet printer, and my Cricut and that’s it! The main downfall of this printable HTV is the availability. It’s only available in 8.5 x 11 sheets, and for nearly 1.50 a sheet, it can add up for sure! But if you’re like me, and you’re obsessed with the watercolor clipart trend, it’s totally worth it. For adhesive printable vinyl, Expressions Vinyl makes a regular adhesive Inkjet Printable Vinyl. I’ve had great luck with this as well! You can use it for indoor and outdoor projects. If you’re using the printable vinyl for something that will receive heavy use or somewhere where the design will be exposed to the elements, I would recommend using one of these laminate sheets over your vinyl to make sure it stays just as beautiful as the day you made it. I’ve used this brand before with great success on indoor projects, but I have not tested it outside yet. However many of the 5 star reviews of this product say they’ve had amazing long lasting results. To try to help you guys out even more, I made a cheat sheet for the different vinyl types. It’s Pinterest friendly, so feel free to save it to refer back to! Thanks so much for reading my guide to the different types of vinyl! I hope it was helpful. Are there any questions you guys have about vinyl that I haven’t answered here? Let me know in the comments! If you’re looking for some amazing fonts to use with your new vinyl, I’ve got you covered. Here’s a list of 14 script fonts that are completely FREE for commercial use. Plus – check out my freebies library for a bunch of free SVG designs you can use with your vinyl cutting machine! Looking for some brand recommendations? 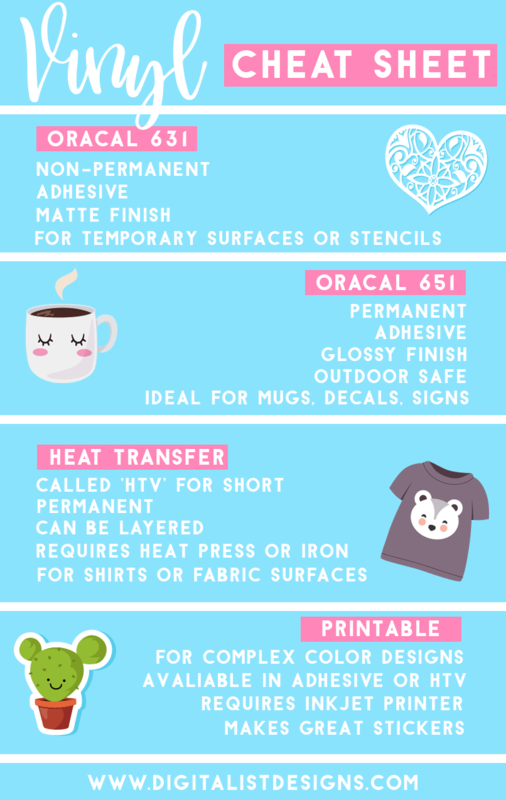 Check out my resources page for my recommended sources for a heat press, free fonts & designs, and even a Cricut or Silhouette if you don’t already have one! Between Cricut and Silhouette as a vinyl cutter, which brand do you recommend in general? I think it depends. Both brands are similar enough that the differences are mostly in the design software. For a complete beginner, I would recommend the Cricut. Cricut Design Space is more user friendly, and it’s easier to upload SVG files or use one of their templates. For more experienced users, I’d recommend the Silhouette Cameo. Silhouette Studio is more advanced, and you can do a lot more with it, but it might be more confusing for beginners. I also don’t like that it costs more money to upload SVG files. If you sew, or you need a machine with more power and features, you really can’t beat the Cricut Maker!